Jacob Coffman was a contemporary of the parents of Abraham Lincoln. Jacob Coffman and Thomas Lincoln were married in Washington County, Kentucky in 1805 and 1806, respectively. Despite a busy week, I have managed to maintain my focus on the "reasonably exhaustive search" for records pertaining to Jacob Coffman, my frontiersman ancestor who lived from 1780-1852. After reviewing the Clayton Library catalog for Washington County, Kentucky, I found that my favorite branch of the Houston Library system had a long list of titles related to the early history of the county. Sanders, Fay Sea. 1995. 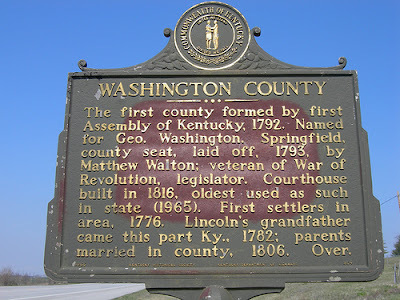 Washington County, Kentucky marriages, 1792-1825. Louisville, Ky. (311 Sage Rd., Louisville 40207): F.S. Sanders. Sanders, Faye Sea. 1987. Washington County, Kentucky wills, 1792-1853. Louisville, Ky. (311 Sage Rd., Louisville 20207): F.S. Sanders. In addition there was a list of taxpayers from 1792-1799 that looked like it might hold some promise. T.L.C. Genealogy (Organization). 1992. Washington County, Kentucky, taxpayers, 1792-1799. Miami Beach, FL: T.L.C. Genealogy. Another source by Ms. Sanders provides an interesting tidbit about Jacob Coffman's father-in-law, Thomas Fowler. Sanders, Faye Sea. 1996. Washington County, Ky. court order book. Louisville, Ky: F.S. Sanders. Sep 17 1791 Dorter, Archibald to Fowler, Elizabeth, "Baltimore County Marriage Licenses, 1777-1798" Dawn Beitler Smith, p. 52, LDS #975.251 V28s. DOROTHY, Archibald - Will: dated 9 Dec 1815, Probate: dated 8 Jan 1816; Leg: Wife Elizabeth; Children: Thomas and Robert, two oldest boys, others: Nancy, Sally, Kitty and Archibald; Executor: Wife- Elizabeth; Witnesses: Thomas FOWLER, Stephen RAY, and William HARDISTY; Signed: Archibald x Dorothy. SOURCE: Sanders, Faye Sea. 1987. Washington County, Kentucky wills, 1792-1853. Louisville, Ky. (311 Sage Rd., Louisville 20207): F.S. Sanders. He did not appear in the list of taxpayers between 1792 and 1799. However, it is important to note the introductory information from the taxpayer book because it states that taxpayers were "all white males over 21." If Jacob Coffman was born in 1780 as indicated by the 1850 census record and his gravestone, then he would not have turned 21 until 1801. He should appear in taxpayer records from 1801 to 1818 when he left the county. LDS Film #7834519 includes early tax lists for Washington County, Kentucky and it has been digitized. Image 530 of 1188 shows Jacob COFFMAN in 1806 not owning any land but in possession of two mare horses. His line on the 1806 tax record showed tick marks for white males above 21 and the horses but there were no marks for white males above 16; Blacks above 16; Steed horses; rates of covering (sp? ); retail stores; tavern license; or value of lots. There is also Abraham COFFMAN on the same page and he does not own any land either. Now that I know these tax lists are available online, I have my work cut out for me to browse through them for Coffman listings. Lawrenceburg is very close to the Chaplin River and Anderson County was formed from Washington & Mercer Counties. I'm hoping your expertise could shed some light. Cindy- I was recently pursuing Jacob Coffman of Lawrenceburg which was known in 1792 as Coffman's Station. I have decided that we do not descend from that person. Jacob Coffman who was killed by Indians in 1792 had a son named Jacob Coffman but he died 21 JAN 1854 in Iowa and is buried in a cemetery located on the Mary Manatt Farm Northwest of Kalona, Iowa according to his descendants. We also are not DNA matches to this group of Coffmans. I know you have been working on this too for many years. Tell me more about the Chaplin River neighborhood. I am looking at tax lists right now and it appears that Jacob Coffman did not own land. Jacob's father-in-law, Thomas Fowler also does not appear to own land. Perhaps they worked the land of Archibald Dorothy or they were hunting, trapping and digging the ginseng.